Last year we published Latest jQuery interview questions and answers and thank you for your overwhelming response. And now we have come up with latest AngularJS interview question. These interview question covers basic to advance. These interview questions will help you to prepare for the interviews, quick revision and provide strength to your technical skills. We will be publishing interview questions in multiple posts. 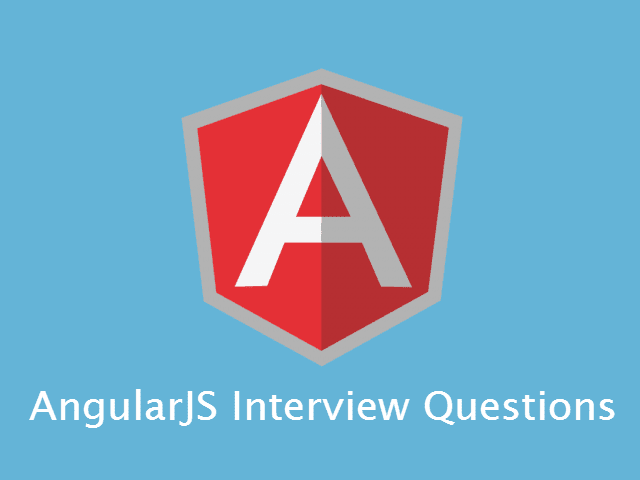 So here is first post with initial set of AngularJS interview questions. Ans: AngularJS is open source client side MV* (Model – View – Whatever) framework for creating dynamic web applications. It gives life to your static HTML and makes it dynamic with its magic. It extends HTML using directives, expression and data binding techniques to define a powerful HTML template. Q2. Is AngularJS a framework, library or a plugin? Ans: The suitable answer is that its a framework. As its lightweight so people also get confused between library and framework.AngularJS is open source client side MVC framework for creating dynamic web applications. Q3. Is it same as jQuery? Ans: NO. jQuery is great library for manipulating the DOM, providing better user experience with animations and effects. You can create website using jQuery but not a web application. jQuery is just a library to play around with HTML, where as AngularJS is a framework to build a dynamic web app as it supports two data binding, MVC, allow testability, templates and many more. Its like AngularJS like a toolbox and jQuery is just a tool. You can read more here. Q4. Does Angular use the jQuery library? Ans: YES, Angular can use jQuery if it's present in your app when the application is being bootstrapped. If jQuery is not present in your script path, Angular falls back to its own implementation of the subset of jQuery that we call jQLite. Ans: AngularJS lets you extend HTML vocabulary for your application. The resulting environment is extraordinarily expressive, readable, and quick to develop. MVC implementation is done right. It extends HTML using directives, expression and data binding techniques to define a powerful HTML template. Two way data-binding, form validations, routing supports, inbuilt services. Q6. What are the key features/concepts of Angular.js? Ans: When you start learning AngularJS, you will come across following terms and these are the features/concept of AngularJS. Q7. Is AngularJS is compatible with all modern browsers? Ans: YES. AngularJS team run extensive test suite against the following browsers: Safari, Chrome, Firefox, Opera 15, IE9 and mobile browsers (Android, Chrome Mobile, iOS Safari). Q8. What is the basic need to start with AngularJS? Ans: To start with AngularJS, one need to make reference of angular.js. The latest version of AngularJS can be downloaded from AngularJS.com. You can either download the required js file and then host them locally or you can also use google CDN for referencing it. Here is the link for google CDN url for referencing AngularJS. Q9. How does the AngularJS framework initialize itself? //but we will rebind on bootstrap again. Above function first check if Angular has already been setup. If it has, we return here to prevent Angular from trying to initialize itself a second time. And then it binds jQuery (if present) and publish external API. And finally angularInit() method does the trick for initialization of AngularJS. Following articles are recommended to know in detail. Q10. What is the bootstrapping in AngularJS? Ans: Bootstrapping in AngularJS is nothing but just initializing, or starting, your Angular app. AngularJS supports automatic bootstrapping as well as manual way as well. Read more Different ways of bootstrapping AngularJS. That's all folk for Part-1. Keep visiting for upcoming set of interview questions and answers. You can also subscribe to RSS feed, follow us on Facebook and twitter to get the updates about this blog. You can also Download jQuery Interview Questions free eBook.